Topics: Services, Crane Design, Overhead Travelling Cranes, Swing Jib Cranes, Gantries, and Hoists. It has 2 DNS records, ns.rackspace.com, and ns2.rackspace.com. 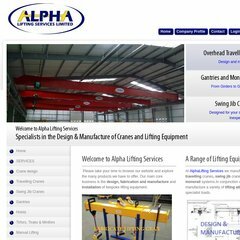 Alphaliftingservices.co.uk's server IP number is 188.65.115.226. PING (188.65.115.226) 56(84) bytes of data.